Heat oven to 350°F. Line a 24-cup mini-muffin pan with mini cupcake liners; set aside. In a large bowl or bowl of a stand mixer, beat together cake mix, water, vegetable oil, gin, tonic water, eggs and lime zest on low speed for 30 seconds; increase to medium speed and beat another 2 minutes, scraping bowl occasionally. Fill cupcake liners 2/3 full with batter; refrigerate extra batter. Bake until golden brown and a toothpick inserted in the center comes out clean, about 15 minutes. Transfer to cooling rack to cool, then repeat with remaining batter (line pan with new cupcake liners). When cupcakes are fully cooled, stir 1 to 2 tablespoons gin (to taste) into frosting. Pipe frosting on cupcakes; garnish with more lime zest and gold glitter sprinkles. I hereby declare this summer the Summer of Boozy Desserts. Because I want booze and a cupcake at the same time, that’s why. 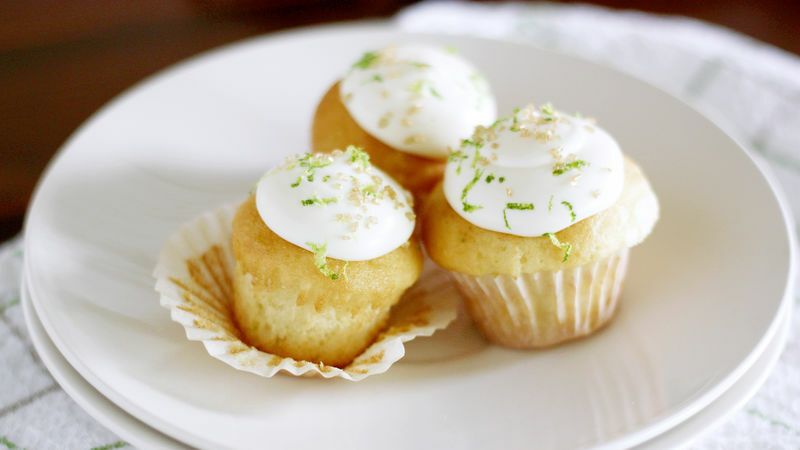 And these Mini Gin & Tonic Cupcakes are the perfect way to kick off the Summer of Boozy Desserts. If you have never tried a G & T before, I suggest you get on it. Honestly, I’d never tried one until this spring but letmetellyou, they are my new summer cocktail. They’re so refreshing and delicious! So when the idea lightbulb went off above my head the other day, urging me to make mini cupcakes using these fab flavors, I was all over it. First, gather up your ingredients (and totally ignore the fact that my bottle of gin is halfway empty. Ahem). We’re going to use Betty Crocker’s golden vanilla cake mix and vanilla frosting for this recipe because a) they’re tasty and b) they make the process go a lot faster and more smoothly – which, in the case of boozy cupcakes, is a total win-win. Beat some gin, tonic water and lime zest into the batter along with the water, eggs and oil, then spoon it into mini cupcake liners. If you have two mini-muffin pans, you can get the whole job done in one session. Otherwise, refrigerate the remaining batter and bake the cupcakes in two batches (that’s right, we’re making 48 of these little bites of heaven!). Bake until golden brown and a toothpick inserted in the center comes out clean. Stir some gin into the frosting. How many tablespoons you want to stir into the frosting is up to you – just don’t put too much in or the frosting will become soupy. Pipe the frosting on top of the cooled mini cupcakes, like so. Decorate the tops of the cupcakes with lime zest and gold glitter for a fancy finish. If I were you, I’d eat about five of these at a time with an actual gin and tonic on the side. It’s the best way to be. Stephanie (aka Girl Versus Dough) + gin + tonic + cupcakes = luv4eva. Check out Stephanie’s Tablespoon member profile and keep checking back for her own personal recipes on Tablespoon!